Although I wasn't going to originally, I ended up buying Who Could It Be At This Hour (All the Wrong Questions) by Lemony Snicket. The book is part of a new series from the perspective of a young Lemony Snicket, before all that Baudelaire orphan business. Sort of a boring week for me, book wise. 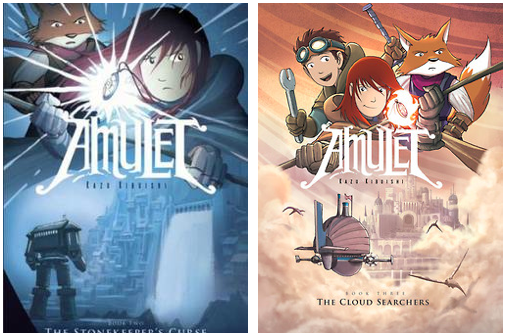 I took out the second and third books in the Amulet series by Kazu Kibuishi early in the week and have already read and returned them. I'm really enjoying this series so far and think that they're a really fun and quick read. To make up for this not so good IMM, here are some Halloween pictures. This is me last weekend. I was sort of Hermione, since I had the Gryffindor robes and the time turner, but I didn't do the hair and I'm wearing a beanie because it was cold. This is my cat, who I very quickly dressed up as Princess Lei, in the costume I had for my build a bear. Her name is Penny Lane and she is not happy with me right now. So Happy Halloween everyone! Feel free to comment with what books you recieved this week and what you're dressing up for for Halloween, if you are. Love the costumes!! The cat as Princess Leia is super cute!!! I am trying to finish up the Series of Unfortunate Events right now, because I am very curious about Snicket's new series. Hope you enjoy it. :D LOVING the costumes - both yours & Penny Lane's (awesome name, by the way!) Sadly I'll be working on Halloween, but I'm thinking about going as Waldo. Not super exciting, I know, but it's easy and won't be a pain to work in. I love the Hermione costume and your cat's costume too! Happy Halloween! Ooh the new Lemony Snicket! Looking forward to hearing your thoughts.